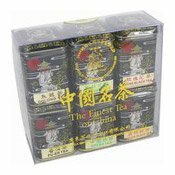 Description: Gift pack with an assortment of Chinese Teas in miniature tea tins. Teas include: Oolong, Jasmine, Rose Black, Pu-Erh, Green, Lychee Black. Ingredients: Lychee, Black Tea, Rose, Black Tea, Green Tea, Oolong Tea, Pu-Erh Tea, Jasmine Tea.